1 Almost everyone has spilled paint sometimes. It makes a mess! Some artists thought that spilled paint was beautiful. They started to do it on purpose! 2 Abstract expressionism is a big name for this kind of art. The artist isn't trying to draw anything special. The painting doesn't look like a cat, a dog, or a tree. Instead, the artist is trying to show his or her feelings. If you look at an abstract painting, you might see lots of colors. They are often all mixed together. You might even see strange things like sand or broken glass! Some artists dribbled whole cans of paint on a canvas on the floor. 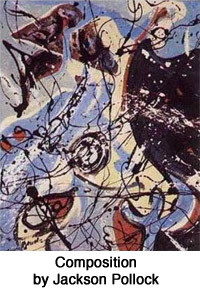 3 One artist who painted like this was Jackson Pollock. He lived in the twentieth century. He grew up with four other brothers. When one brother took an art class, Jackson also took one. At first, he wasn't very good. Then, he went to art school. His art got better. Later, he figured out a whole new way to paint.